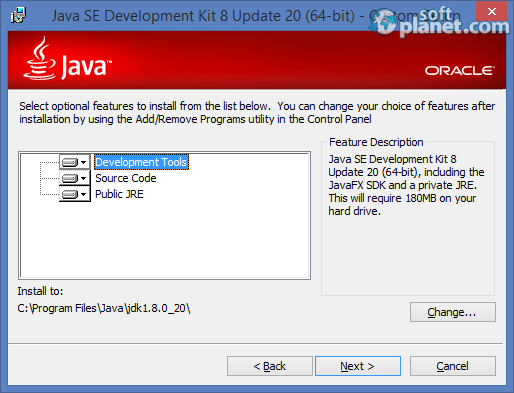 SoftPlanet makes it possible for everyone to get free Java Development Kit 64 download directly from our servers. There is no registration needed for downloading. Every developer needs Java, because this is the official development kit for the popular programming language. Java Development Kit 64 is the suite that will give you all the utilities that you need to program in this language. This version is designated for these users who use 64-bit operating systems and they want to develop Java-based applications. The installation of this application is complicated, because first you have to download a 113 MB file that is the installer of the app. When you start it, the installer lets you choose the components of the program and you can select between Development Tools, Source Code and Public JRE. If you already have a Java app, this installer will delete the old files, then extract the new ones and add them to your hard drive. As a last step, you can view the tutorials, API documents, developer guides, release notes and help that will assist you in starting and using Java Development Kit 64. Java Development Kit 64 is for developers that use 64-bit operating systems and that's why it is mostly for advanced users. Apart from this the application is free and offers an automatic installation process. The only difference in this process is that you can choose the components of the application and you can remove or add any of them. Java Development Kit 64 is VIRUS-FREE! Our security scan shows that Java Development Kit 64 is clean from viruses. The current version of Java Development Kit 64 has been scanned by our system, which contains 46 different anti-virus algorithms. That ensures that Java Development Kit 64 1.8.0 Build 20 is 100% safe for your computer.